Children’s picture books may still feature stories about hungry caterpillars and big red dogs, but they’ve also expanded in another direction. You can now find books containing stories about anxiety, fear, worry, emotions and even OCD. Children’s picture books are doing more than telling amusing tales. They’re effectively helping children cope with a wide variety of issues. One of the reasons books are so helpful for anxious children is because the children see themselves reflected in the stories. They may instantly relate to a main character who always feels anxious, feels left out when a baby brother is born, or is otherwise affected by the same feelings and situations as the children themselves. This reassures children they are not alone in feeling the way they do, and that their feelings or fears are actually common. This can bring a sense of comfort and ease. The books don’t stop at simply presenting a difficult situation, either. With many of the books written by mental health professionals, stories typically offer a solution, outlining how the character successfully deals with or overcomes the difficult situation at hand. When children see the character overcoming difficult situations, they realize they can, too. They can even take the same actions they witnessed the characters taking, essentially arming themselves with helpful coping tools. Anxious children aren’t the only one benefiting from children’s books. They can be helpful to parents, as well. Books can address topics that parents may find complicated or uncomfortable to discuss. Reading a book with their anxious child can open up a conversation that parents may have otherwise had a hard time starting. Once the topic is introduced through a book, parents can invite their anxious children to ask questions and share their own feelings and thoughts that may be similar to those in the story. They can ask their anxious child if he or she ever felt the same way a character does, using the tale as a starting point for a more in-depth talk. Discussing a difficult topic can feel safer when it’s backed by a story, especially when the story comes with answers and a solution. In addition to featuring a built-in solution, many of the books also include author’s notes that further help parents open up discussions and provide guidance for their anxious children. For a deeper look into the types of stories parents can find for their anxious children, here are three children’s books we reviewed in the past. 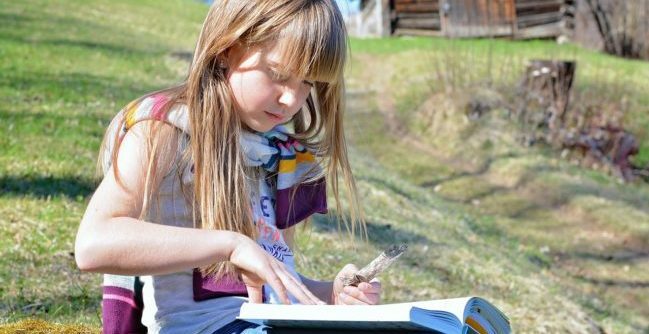 Since new children’s books are consistently hitting the market, you’re sure to find a book that address a topic or subject you may want to discuss. A picture book can make it easier and more comfortable for both you and your anxious child to talk about a problem and find a solution.